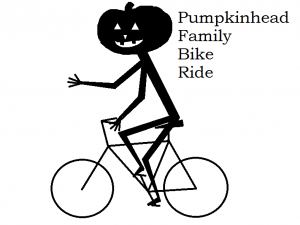 The sixth annual Pumpkinhead Family Bike Ride is set for Saturday, October 13, 2018. The Pumpkinhead is a fundraiser for outdoor educational/recreational programs at Whittenberg Country School, including trail development. The PFBR is an all-ages event, which has four routes to choose from, of 5K, 15K, 25K, and 35K, with a bonus of a bit more. The 5K route is “The Seedling”, the 15K is “The Jack-Be-Little”, the 25K is “The Jack-O-Lantern”, and the 35K is “The Giant Pumpkin”. All routes are there-and-back-again routes, beginning and ending at Whittenberg (at the corner of Reeds Creek Road & Willard Road). Tickets for the ride are $20/adult and $10/youth before October; during October, the tickets are $25/adult and $15/youth. Riders who sign up before October get a PFBR t-shirt. All participants get a PFBR water bottle, a goodie bag, and candy along the way! New for the PFBR this year is “The Pumpkin Seed”, a mini-ride for little munchkins not yet ready for the road; this route is a 1/4 mile loop about the site where the PFBR is based. Tickets for the mini-ride are $1 each, and mini-riders get candy, too. Raffle tickets will be sold (for $1), for a chance to win a new bike, or a helmet, or other prizes. For more information, see the Pumpkinhead’s facebook page, at www.facebook.com/pumpkinheadfamilybikeride, or email the school at whittenbergcountryschool@gmail.com. The PFBR is also looking for a few more businesses, groups, and/or individuals who would like to be sponsors of this event. The lead sponsor, for $100, gets the top recognition on the back of the t-shirt, followed by secondary sponsors at $50 (with a logo) and tertiary sponsors at $25 (text-only). The Pumpkinhead Family Bike Ride is named for Jack Pumpkinhead of Oz, and the event will feature several students dressed as Ozian characters (i.e., Dorothy, Scarecrow, Tin Woodman, Cowardly Lion…). There will be student-made scarecrows on display, including at the four aid stations that are located along the ride’s route. There will also be a sag wagon or two, to help riders who need it.